You are planing on having a family meal for Easter and are looking for nice invitation cards? 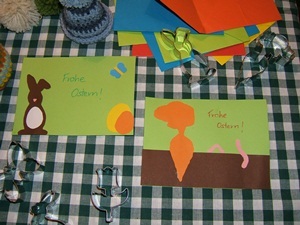 Or, your would like to send individual hand made Easter Greeting Cards to your loved ones? 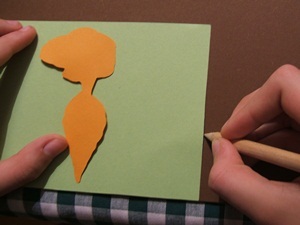 These Easter Card Idea will be a quick and colourful craft to send Happy Easter. This card is a perfect card for invitations. With this crafty idea who have got a theme right at hand for your table decoration to lay out the Easter table and for your Easter cake and even for your appetizers. several sheets of coloured drawing papers, scissors, glue and as stencil cookie cutters with an Easter theme – you have got all what you need to make these Easter cards. As stencil for the sweet rabbit card we used the standing Easter bunny cutter (from the Easter cookie cutter set), for the vegetable bed Happy Easter card we used the carrot cutter (from the vegetable biscuit cutters). The base of our cards is coloured drawing paper in DinA6 size – its easiest to cut our if you use a normal post card and draw around it. That is easy for kids to do as well. 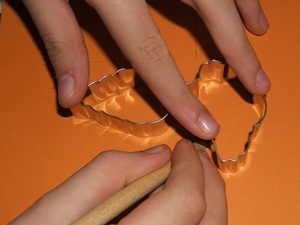 Put the biscuit cutter on an orange drawing paper and mark the outlines with a pencil. Cut along the lines. 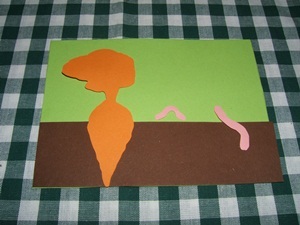 Before you glue the carrot onto the card you will need some soil for the bed. We took the card (a green one) and marked how hight the soil should be, grab a ruler and cut out the rectangular shape. To avoid marks of pencils on your card, just turn around carrot and soil and glue them. Those who like to could add a sun to their card, either paint it or use some coloured paper for a round ball and some rays. 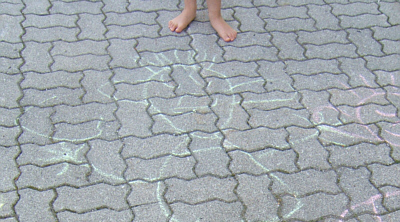 Our little artist wanted to have some earth worms – the organic garden does of course need some of this little soil enhancers. Use a stick to glue all the decorations on the card – if the little fingers are adding to much of the glue, self made crafts don't thrive for perfection, the love can be seen anyway. 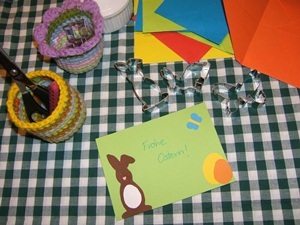 We did put the Easter cards into self made envelopes – and this is a diy idea we will show you another time. How you can use this crafting idea for table decorations? You could turn the cut out carrots and rabbits into name tags, or make cookie place cards. Cut out cookie dough with rabbit cutter and stamp the name of the guest on it (use cookie stamp set) or use food colour to write names on the baked cookie. For cake decorations colour some almond paste or Marzipan with brown (add some cocoa) for the Marzipan rabbits or in orange (with some carrot juice) for Marzipan carrots. And if you wonder how we decorate the starters using our cookie cutters – you can use the cutters to cut out slices of cheese, maybe you have some orange cheddar at hand for cheese carrots. Cutting out cheese in funny shapes, that is a trick we have already used for our popular dragon soup. Are you in the mood for more Easter crafts with your kids?